There are many versions of the card game, Golf. If you’ve ever played Polish Polka, Polish Poker, Turtle, Hara Kiri, or Crazy Nines, you’ll already have a leg up on Paddy O’Shea’s Golf Card Game. While the layout and number of cards dealt varies between versions, the basic premise of all these games is that a hand represents a “hole,” and the goal is to achieve as low a score as possible. A typical game is played over nine hands (or “holes”), or whatever is agreed upon. 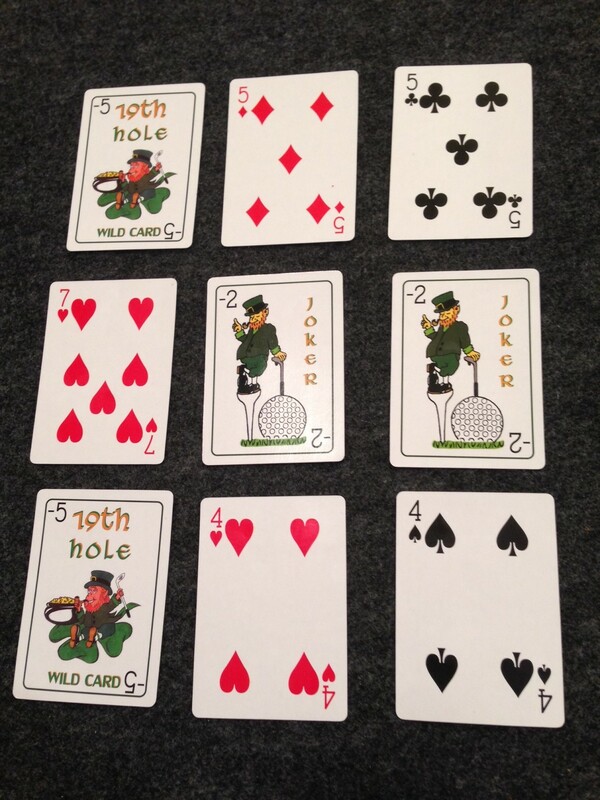 One or more standard decks of cards is often used, but how Paddy O’Shea’s sets itself apart is the inclusion of extra cards — Mulligans and 19th Holes — as well as some interesting game play and scoring differences. 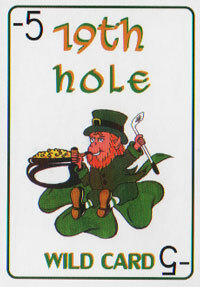 In Paddy O’Shea’s version of Golf, games begin with each player laying nine cards face-down in a 3×3 grid, turning two of them face-up. The remaining cards of the 114-card deck comprise the draw pile, with one card flipped face-up. On your turn you’ll either grab the face-up card, or take your chances on drawing an unknown. Doing so is not unlike adjusting your grip to attempt that draw or fade technique you read about in Golf Digest. Good luck with that. With card in hand, you’ll decide where to place it in your grid, face-up. You can replace an existing face-up card, or remove a face-down card, placing the drawn card face-up in its place. In this way, you’ll gradually whittle away your grid of mostly face-down cards, eventually exposing the whole lot of them by exchanging them with the cards you’ve drawn. The first person to do that (have all nine of their cards face-up) ends the round, with everyone else getting one final turn. Now it’s time to calculate the scores, and call your low-scoring buddy a bad name. Or you could congratulate him. Yeah, right, not in my gaming group. Behold! This is a final score of -14. Scoring is simple. Where you can manage three-of-a-kind — in a row, column or diagonally — you render the value of those cards as zero. Face cards have a value of 10. Aces have a value of 1. All other cards assume their numerical value. So, three Queens in a row are worth nothing, which is a good thing, because you’re looking to score low, but two Queens and a 10, well, now you’re looking at 30 points. The beauty of the wild cards is that they can assume another card type. Thus, having one or more in a row or in a diagonal allows you to complete a three-of-a-kind. Having a wild card in the middle of your grid is the holy grail, giving you maximum flexibility, up, across, and diagonally in both directions! Plus, you get to add their negative value to your score. (Behold the rather amazing final hand I had on the 4th hole in the sidebar.) The Mulligan is not wild, and has a value of 0. While it may at first seem like Paddy O’Shea’s Golf Card Game is strictly about working with your own “grid” and achieving the lowest score possible, after just a few turns you realize there is far more strategy involved in selecting which cards to replace. This realization has everything to do with the simple fact that what you’re discarding could be drawn off the discard pile by your neighboring arch nemesis. I mean, fellow golfing buddy. Think about that for a second. Think about it, but not too long because the jerks behind you are muttering about how you should move your slow, ragtag team of shankers to a public course. That’s right, sometimes a previously face-down card (unknown to you) or a face-up card you want to replace, and about to be placed in the discard pile, might be precisely the card needed by your neighbor. For example, that 9 may be mucking up your score, but your buddy views that 9 as the lynchpin in achieving a glorious 3-of-a-kind, rendering his entire row of 9’s to be worth nothing at all! Your neighbor will be just like that, too. What a duffer. Do you give him what he wants, or do you bide your time? The game bills itself as “The Ultimate Card Game of Skill, Luck & Frustration.” This is not false advertising. There is no question that luck plays a big role in this card game. Our group casually tagged it at 60-40, 60% luck and 40% skill, however making sound strategic decisions about card placement, while remaining cognizant of the cards you may be handing off to your neighbor, form the heart of the game. The frustration comes in when you watch your buddy draw off ALL the cards he needs, while you whiff away in a sand trap for round after round, drawing duds. Frustrating, yes, but the beauty of playing nine holes (rounds) is there is plenty or room for catch up. Our scores between players on individual holes ranged from as low as -17 to as high as 38! We were neck and neck through the first three holes, and one of us gave the leader a run for his money for another good chunk. Everyone enjoyed playing Paddy O’Shea’s Golf Card Game, and one player even remarked, “this is so much better than the traditional Golf card game.” It just might be time to tee up this fun, casual card game for you next game night. We are glad we did.